"Go therefore and make disciples of all the nations, baptizing them in the name of the Father and of the Son and of the Holy Spirit, teaching them to observe all things that I have commanded you; and lo, I am with you always, even to the end of the age. Amen" (Matthew 28:19-20). 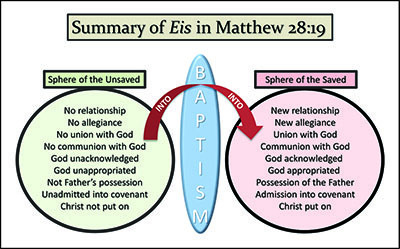 Another grammatical factor in Matthew 28:19-20 concerns the occurrence of the preposition eis in the phrase “baptizing them in (eis) the name of the Father and of the Son and of the Holy Spirit” (ESV). The standard meaning of the underlying Greek preposition connotes “into” and is generally distinguished from the preposition en (“in”). The translation of “into” is given in the American Standard Version, the margin of the English Standard Version, and others (e.g., Beck, Weymouth, et al.). Summary: Though these linguistic experts vary in their terminology, they are unanimous in their recognition of the significance of eis in Matthew 28:19 as it relates to the design of baptism. A person has not entered into a new relationship and allegiance with God, or come into union or communion with God, or gained admission into the covenant of redemption, or put on Christ, and is not a possession of the Father (different ways to say the same thing) until the act of baptism. [See graphic above.] Use of the Greek preposition “into” indicates that when one is baptized in water, the individual is being transferred from one sphere or realm into another, from not having a relationship with deity into having one. Hence, water immersion is unmistakably the dividing line between the lost and the saved, the unforgiven and the forgiven, the non-Christian and the Christian. While deity actually wields authority over the entire Universe (cf. vs. 18; Ephesians 1:21; Colossians 1:15ff. ), no human has willingly placed himself under that jurisdiction or submitted to that authority until he submits to water immersion. A person submits himself to the authority of the Godhead when, having been taught the Gospel generating faith, repentance, and oral confession, he then is baptized into that sphere of authority. Conversely, until a person enacts the divinely designated means by which a person places himself under God’s authority, he remains under the authority and power of Satan. Ownership has not been transferred to deity. Matthew 28:19-20 teaches that a person is neither a disciple of Christ, nor in submission to the authority of God, until that person has been baptized in water. The unsaved person must pass through the waters of baptism in order to become a disciple of Christ and submit himself to the authority of deity. As British Baptist G.R. Beasley-Murray stated emphatically: “In the New Testament… baptism is conversion-baptism. Conversion was fulfilled and expressed in baptism. Baptism was conversion…assumed in the Missionary Commission of Matt. xxviii. 18-20.”33 Or as Schlatter explained: “The apostolic preaching culminated in the offer of baptism; the primitive sermon was a baptismal sermon. Its purpose was not merely the acceptance of an idea: it demanded a definite act.”34 The person who thinks he became a Christian,35 a disciple of Christ, and was saved the moment he “believed” in Jesus—before and without being baptized—was mistaken and did not become a disciple of Christ in accordance with Jesus’ own directive. 2 p. 67, italics in orig. ; cf. Nigel Turner (1963), Syntax, in A Grammar of New Testament Greek, ed. James Moulton (Edinburgh: T. & T. Clark), 3:254. 3 Nigel Turner (1976), Style, in A Grammar of New Testament Greek, ed. James Moulton (Edinburgh: T. & T. Clark), 4:42. Carson agrees with this observation: “Matthew…apparently avoids the confusion of eis (strictly ‘into’) and en (strictly ‘in’) common in Hellenistic Greek; and if so, the preposition ‘into’ strongly suggests a coming-into-relationship-with or a coming-under-the-Lordship-of…. It is a sign both of entrance into Messiah’s covenant community and of pledged submission to his lordship” (p. 597, emp. added). 5 1963, 3:255, italics in orig., emp. added. 6 R.T. France (2007), The Gospel of Matthew (Grand Rapids, MI: Eerdmans), p. 1116, italics in orig., emp. added. 7 France, 1985, p. 414. 8 Marvin Vincent (1946 reprint), Word Studies in the New Testament (Grand Rapids, MI: Eerdmans), 1:149-150, italics in orig. 9 Eiselen, p. 995, italics in orig., emp. added; also Alan M’Neile (1965), The Gospel According to St. Matthew (New York: St. Martin’s Press), p. 436. 10 Alford, 1:307, italics in orig., 2nd emp. added. 11 Robert Milligan (1975), Exposition and Defense of the Scheme of Redemption (Nashville, TN: Gospel Advocate), p. 405. 12 Hans Bietenhard (1976), “onoma,” The New International Dictionary of New Testament Theology, ed. Colin Brown (Grand Rapids, MI: Zondervan), 2:654. 13 Observe that the insertion of the word “symbolically” constitutes subjective interpretation rather than objective linguistic analysis. The same may be said for the theory that maintains that, since a person already has received the saving grace of God by which sins have been cleansed the moment he believes, then baptism serves the purpose of providing an outward demonstration or public declaration that the person has already been saved. The claim is that baptism is a symbol—a visible expression of the forgiveness already received at the point of faith. Hence, baptism is “an outward sign of an inward grace,” a post-conversion “testimony” or “public profession” that the person is already saved, like a “badge” or “uniform” worn by a policeman—merely an outward indication of what the wearer has already become. For example, after praising Mantey’s “causal” eis concept, Kenneth Wuest states: “Thus, we have the scriptural meaning of water baptism. It is the testimony of the person to the fact of his salvation. The only proper recipient of water baptism therefore is one who has received the Lord Jesus as his personal Saviour, and is trusting in His precious blood for salvation from sin”—(1943), Treasures from the Greek New Testament for the English Reader (Grand Rapids, MI: Eerdmans), p. 78, emp. added. The only problem with such theologizing is that the New Testament makes no distinction between actual forgiveness and an alleged post-salvation “symbolical” forgiveness. If a person is forgiven, it would be superfluous to “symbolize” that forgiveness after-the-fact. Once a person dismisses the plain and self-evident import of the New Testament’s repetitive declaration that baptism is for the remission of sins, it follows that he must invent an alternative purpose for baptism. The “symbol,” “testimony,” “picture,” and “badge” concepts are undoubtedly creative and as good as any that might be fabricated to avoid the obvious fact that the New Testament posits remission of sin coincident with water baptism and not before. The only problem is that no shred of biblical evidence, grammatical or otherwise, exists to substantiate them. Baptist scholar J.W. Willmarth rightly asked: “Where is the example of the use of ei)$ to denote a relation between an act as a symbol and some past event or accomplished fact, which such symbol is intended to set forth as emblem or declaration or commemoration?” “If it be but a MERE symbol, or object lesson, or a profession of accomplished facts, what meaning is there in language? or how shall we ever hope to understand the Gospel, as it fell from inspired lips, clothed with human words?”—J.W. Willmarth (1877), “Baptism and Remission,” The Baptist Quarterly, ed. Henry Weston (Philadelphia, PA: American Baptist Publication Society), July, 11:299,317, capitals in orig. Or as J.W. McGarvey explained: “It is a common assumption that Saul’s sins had been really forgiven before his immersion, and Ananias required him only to formally wash them away. But this is a mere combination of words to hide the absence of an idea. How can a man formally do a thing which has already been really done, unless it be by going through a form which is empty and deceptive? If Saul’s sins were already washed away, then he did not wash them away in immersion, and the language of Ananias was deceptive. But it is an indisputable fact, that at the time Ananias gave him this command he was still unhappy, and, therefore, unforgiven. Immediately after he was immersed, he was happy; and the change took place in the mean time, which connects it with his immersion”—(1872), Commentary on Acts of Apostles (Lexington, KY: Transylvania Printing & Publishing), seventh edition, p. 135, italics in orig. Albrecht Oepke, associate professor and New Testament Chair at the University of Leipzig, in his discussion of “the saving significance of baptism” and its “connection with purification from the guilt of sin,” debunks the “symbol” idea: “The significance of baptism thus depends on the fact that it is a real action of the holy God in relation to sinful man. Hence both a superstitious and also a purely symbolical understanding are excluded…. To baptism as a mere rite or realistically developed symbol no such incomparable efficacy could be ascribed in the NT world of thought”—from his article “ꞵάπτω, ꞵαπτίζω” in Gerhard Kittel, ed. (1964), Theological Dictionary of the New Testament (Grand Rapids, MI: Eerdmans), 1:540. Or as J.J. Van Oosterzee explained: “Baptism is styled ‘laver of regeneration,’ not because it obligates to regeneration, nor because it is the symbol of regeneration, but because it is really the means of regeneration, if truly desired and received in faith (which is tacitly assumed in respect to those adult Christians who by their own free act were baptized)”—(1870), The Epistle of Paul to Titus (New York: Charles Scribner), p. 20, italics in orig. The premiere passages in the New Testament that assign symbolic value to baptism simply do not expound the post-conversion concept. True, baptism is, indeed, a symbol. But what does baptism symbolize? It symbolizes: (1) Christ’s death, burial, and resurrection, as per Romans 6:3-4; (2) the act of “cutting off” as in circumcision (sin vs. skin), as per Colossians 2:11; and (3) the waters of the Noahic Flood, as per 1 Peter 3:20-21. How could anyone get out of these explicitly stated symbolic meanings that baptism symbolizes past forgiveness that was achieved prior to being immersed? Jettisoning theological presuppositions enables the honest exegete to conclude that the Bible nowhere expounds a post-forgiveness role for baptism. Quite the contrary, the symbolism which the New Testament explicitly associates with water baptism (i.e., Christ’s burial, cutting of skin, and Flood waters) further verifies the essentiality of immersion as a mandatory prerequisite to forgiveness. See Dave Miller (2003), “Is Baptism a Symbol?” Apologetics Press, http://apologeticspress.org/APContent.aspx?category=11&article=1232&topic=379. 14 Bietenhard, 2:655, emp. added. 15 W.E. Vine (1966 reprint), An Expository Dictionary of New Testament Words (Old Tappan, NJ: Revell), p. 100, emp. added; cf. Wesley Perschbacher, ed. (1990), The New Analytical Greek Lexicon (Peabody, MA: Hendrickson), p. 294. 16 1934, p. 649, emp. added. Paul undoubtedly intended to key into this concept when he chided the Corinthians for their divisive ways by posing three critical questions, the third of which was: “Or were you baptized in (eis-into) the name of Paul?” (1 Corinthians 1:13). The question obviously echos Matthew 28:19. Paul sought to prick the Corinthians with the fact that when they were baptized in water, they were placing themselves under (eis-into) the authority of Christ—not Paul, Apollos, Cephas, or anyone else. Observe also that his remarks in 1 Corinthians 1:10-17 further underscore the absolute essentiality of water baptism to salvation: “For it has been declared to me concerning you, my brethren, by those of Chloe’s household, that there are contentions among you. Now I say this, that each of you says, ‘I am of Paul,’ or ‘I am of Apollos,’ or ‘I am of Cephas,’ or ‘I am of Christ.’ Is Christ divided? Was Paul crucified for you? Or were you baptized in the name of Paul?” (vss. 11-13). What did Paul mean when he used the expression to be “of” someone (“I” [ Ἐγὼ] with the genitive of the person)? He alluded to an authoritative positioning of a person beneath another. To be “of” another means to have been saved by and come under the jurisdiction of that other and, hence, to “belong to” (R.C.H. Lenski , The Interpretation of St. Matthew’s Gospel [Minneapolis, MN: Augsburg], p. 42; cf. ISV,NRSV,RSV) or “follow” (NIV,CJB,CEV,ESV, GNT,NCV,WEB) that person. This relationship is inherent in the three questions Paul asks the Corinthians—questions that pinpoint essential prerequisites to being counted “of” someone. First, in order to be “of” someone, that someone must accordingly be qualified for others to follow him, devote themselves to him, and place themselves under his exclusive rule, Lordship, and control. That person must be “undivided.” To be undivided means that he must have no rivals (e.g., Paul, Apollos, etc. ), or competing factions, he must be your sole Savior Who is singular, unique, and unsurpassed by all others. His followers constitute a single body, of which He is the only Head. Hence, the indivisible Christ makes no allowance for other heads, lords, or bodies. He possesses “right over all” (Henry Alford , Alford’s Greek Testament [Grand Rapids, MI: Baker, 1980 reprint], 2:477). Your loyalty must be directed to Christ alone. Second, that person must be crucified for you. Third, you must be baptized into his name. As discussed in the section on onoma, to be baptized into the name entails submitting oneself to the authority of the one named, or as explained by John Locke, “to enter himself a Disciple of him into whose Name he was baptized, with Profession to receive his Doctrine and Rules, and submit to his Authority”—(1751), A Paraphrase and Notes on the Epistles of St. Paul to the Galatians, I&II Corinthians, Romans, and Ephesians (London: S. Birt, J. Walthoe, et al. ), p. 94, emp. added. (Also Macknight, p. 144; Robertson, Word Pictures, 4:75). 17 A.T. Robertson (1930), Word Pictures in the New Testament (Nashville, TN: Broadman Press), 1:245, emp. added. 18 Joseph Thayer (1977 reprint), A Greek-English Lexicon of the New Testament (Grand Rapids, MI: Baker), p. 447, emp. added. 20 p. 301, italics in orig., emp. added. 21 H. Leo Boles (1952), The Gospel According to Matthew (Nashville, TN: Gospel Advocate), pp. 564-565, emp. added. See also Lange (1884), 1:557—“a baptism under the authority of, and unto the authority of the triune God.” Also G.G. Findlay (no date), St. Paul’s First Epistle to the Corinthians in The Expositor’s Greek Testament, ed. W. Robertson Nicoll (Grand Rapids, MI: Eerdmans), p. 766—“‘The name’ connotes the nature and authority of the bearer.” For more discussion of the concept of authority, see Dave Miller (2012), Surrendering to His Lordship (Montgomery, AL: Apologetics Press). 22 Sellers Crain (2011), Truth for Today Commentary: Matthew 14-28 (Searcy, AR: Resource Publications), p. 484. 23 F.F. Bruce (1963), The Books and the Parchments (Westwood, NJ: Fleming H. Revell), p. 66, emp. added. 24 James Moulton and George Milligan (1930), Vocabulary of the Greek New Testament Illustrated from the Papyri and Other Non-literary Sources (Grand Rapids, MI: Eerdmans, 1982 reprint), p. 451, first emp. in orig., second emp. added. 25 Alexander Souter (1917), A Pocket Lexicon to the Greek New Testament (Oxford: Clarendon Press), p. 46. Souter served as professor of New Testament Greek and Exegesis at Mansfield College, Oxford, and later succeeded William Ramsay as Regius Professor of Humanity at the University of Aberdeen. He published an edition of the New Testament Greek text on which the English Revised Version of 1881 was based (the British precursor to the ASV). 26 Frederick Danker, rev. and ed. (2000), “ὄνομα,” A Greek-English Lexicon of the New Testament and other Early Christian Literature (Chicago, IL: The University of Chicago Press), p. 713. 31 p. 323. Cf. Lars Hartman (2013), Approaching New Testament Texts and Contexts: Collected Essays II (Tubingen, Germany: Mohr Siebeck), pp. 145ff. See also Murray Harris (1978), “Prepositions and Theology in the Greek New Testament,” in Colin Brown, ed., The New International Dictionary of New Testament Theology (Grand Rapids, MI: Zondervan), 3:1209, who summarizes three views: “it may denote a transference of ownership” in which “the person being baptized passes into the possession of the Triune God,” or it can denote “to endow a person, through baptism, with the benefits of the salvation accomplished by Jesus Christ,” or “denoting the fundamental reference or purpose of some thing, rite or action.” Observe that all three of these views presuppose that baptism precedes salvation. Cf. Wilhelm Heitmuller (1903), Im Namen Jesu (Gottingen: Vandenhoeck & Ruprecht). 32 J.W. McGarvey (1875), The New Testament Commentary: Matthew and Mark (Delight, AR: Gospel Light Publishing), p. 254, italics in orig., emp. added. 33 G.R. Beasley-Murray (1966), Baptism Today and Tomorrow (New York: St. Martin’s Press), pp. 93-94. 34 Adolf von Schlatter (1955), The Church in the New Testament Period, trans. Paul Levertoff (London: SPCK Publishing), p. 26. 35 Johannes Lindblom believed that maqhteuvsate (“make disciples”—DM) could just as rightly be rendered Хριστιανοὺς ποιήσατε (“make Christians”—DM) in (1919), Jesu missions-och dopbefallning, Matt. 28:18-20, tillika en studie överdet kristna dopets ursprung (Stockholm: Svenska Kyrkans Diakonistyrelses Bokförlag), p. 132.